Shadow and light, somberness and joy, conflict and peace, my canvases are an extension of my being; A conversation between the world and I." "Experiences of my life, freedom and nature are the essence of my expressions in my paintings. I love the play of colors in my figurative forms, nature and the surroundings. Most of my feminine forms are in white symbolizing the purity and essence of life amongst the colorful surroundings". Debjani’s has been able to define herself not only as an artist but also as a social worker and a teacher. 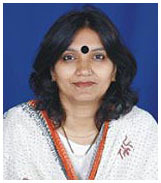 Her social work has kept her involved with issues of rural women and children. This experience has found it’s way in her form of expressions. 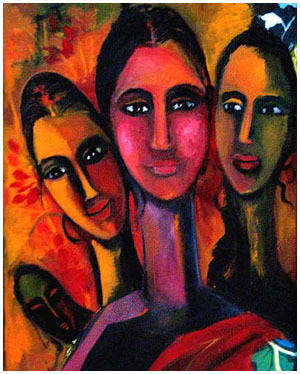 Her paintings depict rural women in their natural forms and emotions. "Her portrayals of woman as spiritual beings are imbubed with vibrancy, bringing energy and feelin to both ordinary domestic activities and simplest portraiture." - Paula Laniado(artist New York,USA). "The fusion of abstraction and realism are skillfully expressed, particularly in Moods and Sleeping Beautuies, each painting is an expression of a unique way of perceiving the world,reonating with the passion for the medium, intellectual curiosity and for the process that unfolds....wonderful works." Graduated with honors in Political Science from Jadavpur University in 1986 . Post Graduate Diploma in Fine Arts from Bangiya Sangeet Parishad, affiliated with Rabindra Bharati University in 2004. 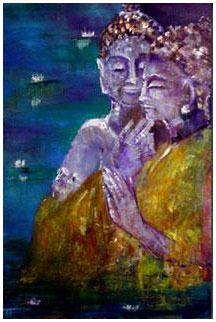 Post Graduate Diploma in Buddhist Studies, specializing in Art and Architecture. 2005 Chitrakoot art gallery, Kolkata. 2006 Monsoon show, Vision Arts. 2006 The Unreal reality, Artist Centre, Mumbai. 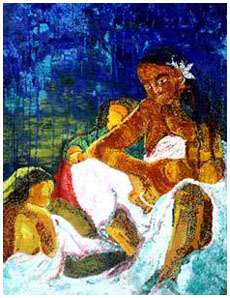 2006,05 Monsoon Show of Contemporary Indian Art by Concern India Foundation, Mumbai, India. 2005 Monsoon show Nandan Gallery.